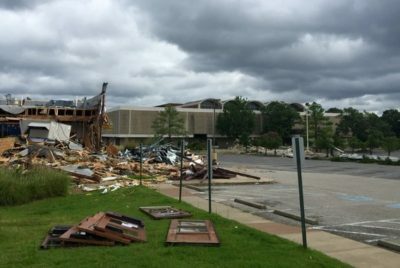 Demolition has started in East Memphis on the old Sears department store and On The Border restaurant building nearby to make room for the Poplar Commons shopping center to be anchored by a Nordstrom Rack. By Saturday, demo crews had reduced to rubble most of the restaurant structure and the canopy for the walkway connecting Poplar to Sears’ front door. A third building, the Sears automotive service center, also will be removed. The northwest corner of Poplar and Perkins Extended will be transformed into a 135,200-square-foot retail center comprising five buildings and 600 parking spaces. Owner Seritage Growth Properties filed documents for a building permit in late spring to construct the first three buildings at an estimated cost of $15.5 million. They include the biggest — toward the back of the property where the Sears building now stands — that will house the 33,000-square-foot Nordstrom Rack as well as three other retailers. An Ulta Beauty store is to be built on the west side of the property just behind where On The Border stood. Representatives of Seritage Growth Properties, a real estate investment trust affiliated with Sears, have said total cost to build Poplar Commons will be $25.2 million once all five buildings are erected.